A question I get frequently asked at my clinics is “I created a great melody, how can I come up with chords for it?” The fact that there are many ways to harmonize a melody depending on the style of music is a blessing and a curse. Harmonizing melodies is an art in itself and although, in the end, it is an ear decision based on personal taste and style, there are ways to simplify the process. In this article I would like to show you one approach based on functional harmonic principles, i.e. based on chords that function as tonic, subdominant, or dominant (including substitutions), and melodies that revolve around the natural resolution of the half steps of the major scale, namely definitive melodies. Acoustically, the strongest triads are the major triads (I IV V) of the major scale. The minor triads (ii iv vi) can be seen as substitutes for the major triads by virtue of common tones. For example, in the key of C Major, C shares two common tones with Emin and Amin, functioning as tonic chords; F shares two common tones with Dmin, functioning as subdominant chords. Although the diminished triad, Bº (vii) shares two notes with G (V), it will not be used in this context. These triads will be the basis for the type of harmonization we are going to explore. A) 1, 3, 5 (DO, MI, SO) – Resting tones: represent the resolution of an active tone. B) 2, 6 (RE, LA) – Active whole steps: most naturally resolve by whole step to a resting tone. D) Chromatic tones: substitute for the diatonic tones and serve as connectors between the whole steps of the major scale. Half steps. (FA –> MI; TI –> DO). These will give us a clear idea of the momentary key in place at any time. Contemporary music, including jazz, is usually based on two-measure phrases, where: odd-numbered measures are strong and even-numbered are weak. A common and logical way to organize chord progressions is to place the tonic function chords on the strong measures and the chords that will lead to tonic (chords of subdominant and dominant function) on the weak measures. In general, cadences usually occur from a weak measure (or a weaker beat of a measure) to a stronger measure (or stronger beat of a measure). Within a two measure phrase the relative strength of the beats is: S=very strong; W=weak; s=strong; w=very weak. Example 2 shows a typical jazz progression. Notice the placement of the subdominant and dominant chords (II V) on weak parts of the measure; and the tonic chords, Cmaj7 and Amin7, on strong measures. By adding a dominant functioning chord right before any of the major or minor chords of the major scale, you are making such chord a momentary tonic, in effect creating a momentary key. These dominant functioning chords are known as “Secondary Dominant Chords.” From example 2 above, you can see how the E7(b9) before the Amin9 on measure 3 makes it a temporary tonic in A minor, reinforced by the subdominant functioning Bmin7(b5). Each one of the notes of the major scale can be the tonic, third, or fifth of a diatonic triad. For example, in the key of C Major, the note C can be found on C (tonic), Ami (third), and F (fifth). 1st Generation: triads I IV V (or minor substitutions). The melodies that can be harmonized exclusively with diatonic triads are typically very simple, as shown in the following two examples. The 2nd generation allows us to harmonize more notes with only one chord. The following example presents a few possibilities using two notes from the C Major scale. 3rd Generation – Up to the 9th. Five parts chords or some implied form. 4th Generation – Up to the 11th. Six parts chords or some implied form. 5th Generation – Up to the 13th. Seven part chords or some implied form. How do we get generations 3-5 from the basic triads? This approach will keep the same tonic, only giving us a larger chord form. This approach offers other possibilities, in essence using the basic triad as an upper structure to form chords with a different root. I hope these ideas will help you in your musical journey! In our next installment, we will apply these concepts to the harmonization of a melody. 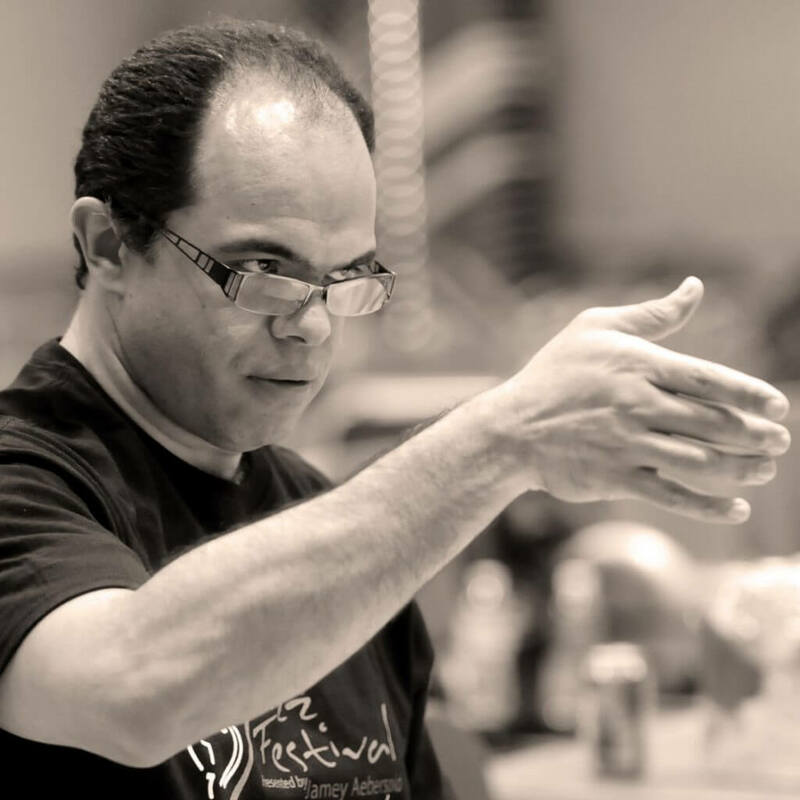 Dr. Garcia is a composer, arranger, producer, recording engineer, multi-instrumentalist, and educator from the Dominican Republic. He currently is the Director of Music Technology at the University of Northern Colorado. Among Garcia’s recording and/or performing credits are the album Yo Por Ti by Puerto Rican artist Olga Tañon, Grammy Award winner as Merengue Album of the Year 2001; Milly Quezada’s Tesoros de mi Tierra, which reached number 14 on Billboard’s Tropical Song charts; and national and international performances with the Socrates Garcia Latin Jazz Orchestra. He has presented clinics at regional and national conferences and has conducted his music nationally and internationally. His latest album, Back Home (MAMA Records), performed by the Socrates Garcia Latin Jazz Orchestra, is a symbiotic combination of Afro-Dominican and Afro-Caribbean genres within the aesthetic of contemporary orchestral jazz. An award winning album, it has received numerous accolades by critics and jazz fans alike, nationally and internationally.